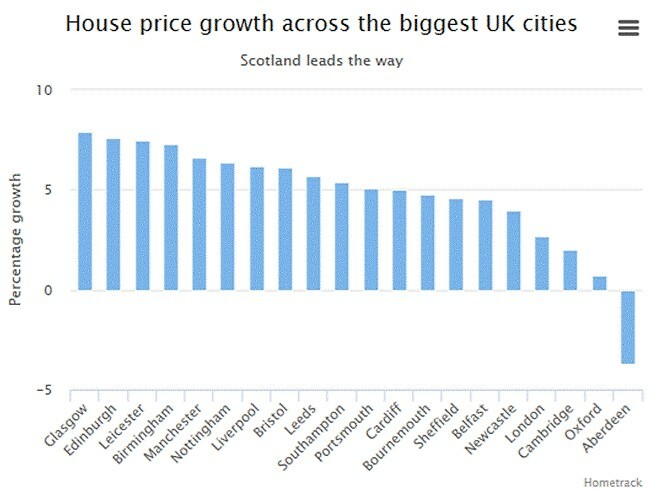 Glasgow and Edinburgh have the fastest-growing house prices of all UK cities, according to research by Hometrack. Property in Glasgow increased in value by 7.9pc in the 12 months to November, outpacing Edinburgh at 7.6pc, with the number of sales in Scotland forecast to grow next year too. Across the biggest 20 UK cities, average house prices rose by 6.3pc, up from 4.9pc a year ago. This has gathered pace in the last six months, as demand for property in regional cities outside southern England has climbed. Richard Donnell, head of research at Hometrack, said: “Over the last 12 months there has been a dramatic south to north shift in the momentum of house price growth, which has culminated in Glasgow registering the fastest rate of house price inflation in the UK. Leicester, Birmingham, Manchester and Nottingham also recorded soaring growth. Areas where house prices are at or below their 2007 levels in nominal terms turned in the strongest performance. Not all of Scotland recorded such strong growth in 2017, however: prices fell in Aberdeen by 7.7pc as the impact of sinking oil prices continues to affect the market. Meanwhile low growth in London of 2.7pc, compared to 6.3pc last year, is being offset by higher levels in regional cities; Mr Donnell has forecast that next year the average UK-wide rate will be around 5pc, partly due to better affordability levels and less uncertainty for the market. This is in contrast with his estimate for London's growth, which he put at 1pc next year, with prices falling in real terms, as well as a further decline in the number of sales.